On September 28th, rock band baroque officially announced their revival through their website. 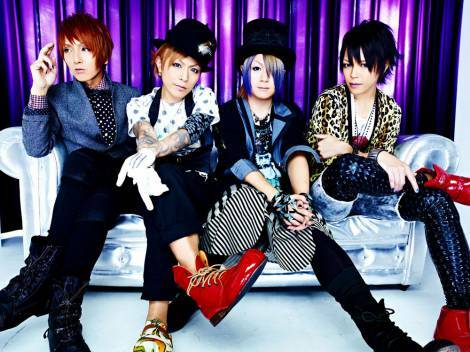 They will be holding a one-man live called "baroque Re: First Live IN FUTURE" at the TOKYO DOME CITY HALL on January 6th, 2012.
baroque is a four-member band comprised of with Ryo (Vo), Kei (G), Akira (G), and Bansaku (B). �The band was formed in 2001, and they made their major debut with "Gakidou" in July 2003. However, Bansaku left the band in September 2004, and baroque disbanded after holding their final live, "baroque last live mumirai -NO FUTURE-", at the Zepp Tokyo in December 2004. �Although their activity period was quite short, baroque enjoyed a high level of popularity, as they even got to perform a live concert at the Nippon Budokan. For the first time in six years and a half, the members reunited for a free live called "Odai wa Kekkou Irimasenkara" this past July. �They performed 14 songs at the live, and they told the 10,000-member audience, "We hope to gather again like this. Until then, bye bye." Stay tuned for more updates on their reunion and activity plans!